Instructions: To see more of this tulip tin, click here. Cut a 7 x 12" piece of cottage designer paper from the Tulip Time Paper Collection, cut additional small strip if tin is larger than 12 inches around, adhere to tin. Cut a circle die to fit top of tin from designer paper and adhere. Stamp and sponge the Large tulips in Buttercup and Lulu Lavender, and Medium tulips in Cantaloupe, and the small tulips in Vibrant Fuchsia from the Tulip Time set onto white cardstock and diecut with corresponding dies. 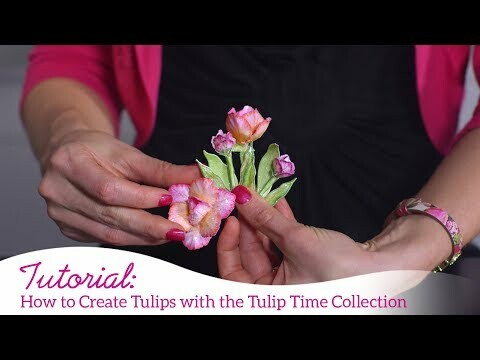 Shape with the 3D Tulip Shaping Mold, add lavender beaded stamens to the centers of the large lavender tulips and pearl yellow stamens to the centers of the large yellow tulips and add glitter all the flowers. Stamp and sponge leaves from the Tulip Time set in Olive onto white cardstock and cut out with corresponding dies. Stamp the leaves from the Leafy Accents set in Library Green, cut out with corresponding dies. Sponge the leaves with Bamboo Leaves. Shape with 3D Leafy Accents Shaping Mold. Cut out two dies with the Petite Pockets Accents Die in white cardstock, adhere the two together longways to create a lattice and adhere to tin to the right of the cottage, adhere yellow tulips and leaves made with the Leafy accents on top. Cut out two fancy dies for the sentiment from the Ornament Tags die in magenta designer paper from the Tulip Time Paper Collection and stamp the sentiment from the Just for You Sentiments set in black and cut out with the rectangle die in the Ornament Tags Die. Cut the tulip row from the Tulip Cart and Fence set in half and layer in the cart, adhere the wheel to the cart with foam tape for dimension and adhere the cart to the right of the lattice created with the Petite Pocket Accents Die. To the right of that, adhere the sentiment on the top and the fence below with hyacinths and medium tulips adhered to the front of the fence, as seen in photo. 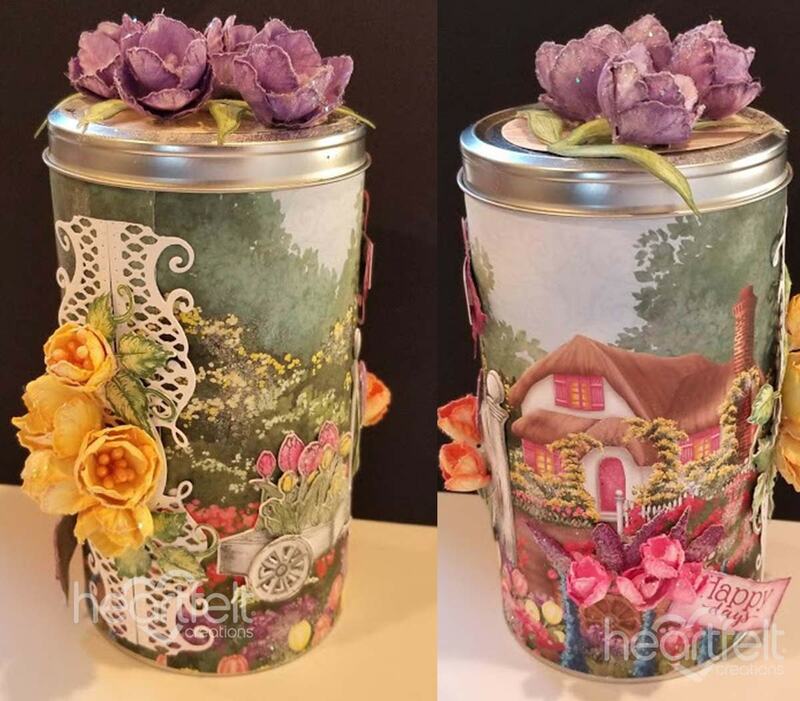 In front of the cottage adhere hyacinths and small tulips in the cart that is on the designer paper and cut out the Happy Days sentiment from the paper collection and adhere to the front of the cart. For the top of the tin, adhere the lavender tulips and leaves as seen in photo.